Saturday, January 23, 2016 was a beautiful, mild mid-winter day at the Hall’s Lake Natural Area. Under a pale blue sky with no wind, and upon a too-thin-for-snowshoes snow pack, Isabella Conservation District Environmental Coordinator and Chippewa Watershed Conservancy volunteer Mike LeValley shepherded a group on a tour of discovery on the trails of the Neely, Kabana and Schaftenaar preserves to see what signs of animal activity might be seen. There was a distinct shortage of deer tracks in an area that normally sees plenty of deer, perhaps because the local deer were concentrated on a nearby unseen wintering ground. 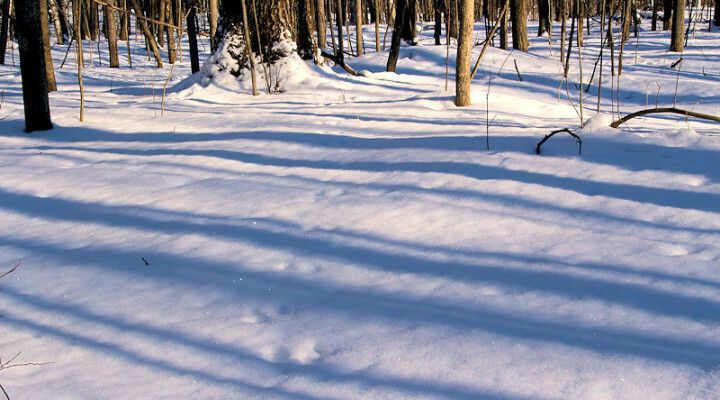 Nevertheless, there were tracks of other animals to be seen, including voles, mice, rabbits, squirrels, and coyotes. And of course, not all signs of animal activity in winter take the form of tracks. The group saw evidence of Pileated Woodpecker excavations in big tooth aspen trees, chewed red pine branches and needles from the resident porcupine, nibbled acorns left by squirrels and chipmunks, as well as their stashes hidden away in hollows and cavities at the base of trees, Incisor-scored stumps of small trees near the lake shore were evidence of the past presence of beavers. Though this walk was billed as a search for winter animal activity, the group also saw how plant life adapts. Most forms of aquatic plants revert to a dormant stage during the cold winter months, but the group even found a cluster of evergreen duckweed beneath the snow and ice covering the pool of water near the Kabana Creek foot bridge. Join us for another winter program on the preserves on February 20th at Sylvan Solace, when Mike presents a practical demonstration of how the amount of lumber in a tree can be estimated.